Oyster Bay Golf Links was voted the 1983 Golf Digest “Resort Course of the Year.” It was all ranked by the same publication among the top 50 public courses in the country in 1990. It is a rare, harmonious blend of the penal, heroic and strategic philosophies of golf course architecture. Architect Dan Maples and developer Larry Young created a course where variety and innovation are the name of the game. There are several marsh-oriented holes, two island green par-threes. This is combined with strategic (and stunningly beautiful) fresh water lakes, long holes and short holes. This all adds up to the consummate combination of shot making requirements. The par-70 course plays to just under 6,700 yards, but cavernous bunkers, wickedly undulating greens and lengthy par 4’s make Oyster Bay Golf Course a test of one’s mettle. 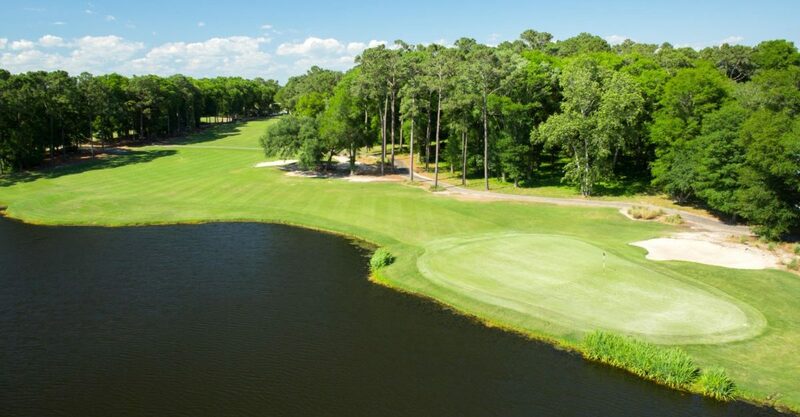 The beautiful water backdrops, as well as the unique design characteristics of many of the holes of the course make this a North End course that every golfer has to experience at least once in their Myrtle Beach travels. Most people who play Oyster Bay, and up coming back many more times. It is the type of course, that you tend to both appreciate and play better the more chances you get to try. As part of the Legends Group, all rounds at Oyster Bay Golf Course include a free breakfast buffet, lunch from the menu, and two draft beers or fountain soft drinks. The Legends offers great rates on both stay and play packages, as well as tee time only packages. Their specialties include four and five courses packages. This incorporates their five outstanding courses, and first-rate onsite accommodations at the Legends Resort complex.